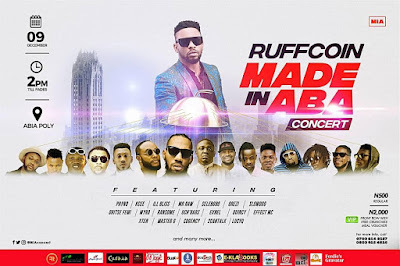 Ruffcoin is planning to set the Enyimba city on fire with this concert a one of a kind concert which has never been seen nor witnessed before in the city. Come December 9th 2018, all roads lead to Aba the Enyimba city for this musical showdown. The concert will have massive entertainment packed with the best of music from both Nigerian A-list artists and Aba finest artists,rib cracking jokes from certified comedians like Dauda and a host of others. Just mark the 9th of December on your calendar and you will soaked with entertainment. The made in Aba concert promises to be entertainment extravaganza and nothing like the city of Aba has ever witnessed before. The concert is billed to take place on 9th December 2018. Venue: Abia State Polytechnic School Field. Come let us party and boggie down as we shut the city down.